Beautifully designed red white stripe linen and canvas stockings - Plenty big for lotsa goodies. Names Custom embroidered personalizing included. In this assortment, the Diagonal stripes stockings get personalized on the button tags in a smaller size font and the other stockings pictured with personalization directly onto the stockings in a larger font. If you want to unify the font size, you can request that on the notes to seller on the checkout screen and we can make all fonts same small size. We think the different size fonts add to the homespun look on this assortment. But if you wanted the same font size, just let us know in the instructions/notes on the checkout screen and we will make all names smaller to match the font size on the tags. Or if you prefer all stockings to be embroidered on the stocking, not tags for the diagonal striped stockings, just let us know that and we will embroider them on the boot top instead on the tag. There is COMMENTS section on the checkout screen where you can put all these instructions. Measured The stocking is big, about 23" diagonally and 8.5" wide. The diagonal stripe stockings are little narrower but make a great set. Materials: The stocking is made from linen, canvas and cotton materials. Lining: YES. 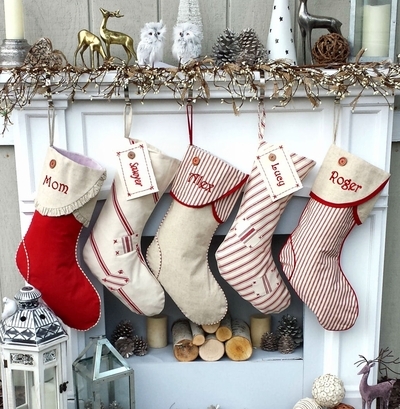 This stocking is lined inside with soft lining for the heirloom quality. PERSONALIZATION : PLEASE REFER TO THE PHOTO FOR DEFAULT PERSONALIZATION : Names can be personalized on the cuff of this Christmas stocking with embroidery thread to compliment the colors of the stocking and the design on the stocking.